1) Wedding planning involves planning out your expenditure and as the costs begin to build up you can often be left feeling overwhelmed. A simple way to conquer this is to start planning ahead and making sure you save the required amount of money to ensure that you can afford the type of wedding you want. Another way to ease out your financial stress is to consult your parents before hand to find out how much they are willing to chip in. After you know how much you can spend do your research to find a venue that you can afford and more importantly one that you actually want to have your wedding at. 2) Prioritize your list of things to do. Ensure that you tick off the most important things well before crunch time – things like choosing a venue, picking a caterer and hiring an entertainer can all be done a few months before hand so you can focus on other things closer to the wedding date. In doing this you eliminate the risk of leaving things to the last minute and also prevent yourself from stressing out closer to the wedding date. Also, it wouldn’t hurt to have a wedding planner in an easily accessible place so you can plan out exactly when you want particular tasks to be finished by. There are also many online tools that allow you to keep a planner on your computer which can make it easier to stay on top of things. 3) An integral part of wedding planning is to prepare a guest list before you hand out initiations. It is important to remember that the amount of guests you invite will have an influence on your overall wedding budget so it wouldn’t be a bad idea to limit the number of guests you invite. For instance, inviting close friends and family will is a better option than all out inviting all your acquaintances and people you have met over the years. This will not only result in more planning but will also force you to increase your budget. To ensure you only invite the number of guests you can afford it is useful to plan ahead. A good rule of thumb is to spread your guest list so you assign half your number of guests to be chosen by the bridge and groom and 25% each to the set of parents. 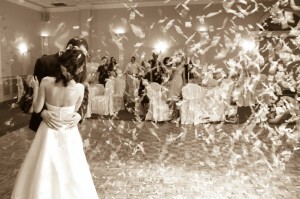 4) Another way to simplify your wedding planning is to keep every aspect of the wedding as simple as possible. Now this is fairly obvious, but it is easy to get carried away with little things such as the entertainment, fancy invitations and overly monumental venues. It is important to keep in mind the true value of getting married and to not fall into the trap of planning a wedding simply to impress people. The entertainment aspect of your wedding should not be a large part of your budget and some light entertainment for the day will suffice. Also, there is no need to spend a whole lot on initiation cards as simple invitation cards can look more elegant than ones with fancy designs on them. Asking around your family and friends to assist you with the design of your invitation cards can actually be a worthwhile thing to do. 5) Last but not least, it is vital to remember that you don’t have to deal with all the planning stress involved in a wedding. Know that you can trust your bride to take care of simple things such as planning the entertainment so you can ease the pressure of yourself. Also, asking your friends and family to help you do certain things can go a long way in assisting you with simple things. In fact, assigning jobs to the people around you can be an effective way to stay on top of everything. While it may be hard to entrust aspects of the most memorable day of your life in the hands of someone else it is something that you will have to come to terms with if you want your wedding planning to go smoothly. Setting up your registry should be fun! Weddings are many times the most important day of couples life together which remain in the memories of your guests for the rest of their lives. In order for a couple to get their lives started right away after they return from their honeymoon, it’s important to set up a wedding registry for all the essential items. In the absence of a wedding registry people may end up receiving gifts that they do not want or receiving more than one similar gifts which end up being a waste of time and money for both guests and the bride and groom. Wedding registries provide guests with an opportunity to be able to purchase gifts for the bridal couple in an organized and time effective manner. Before starting your registry it is important to first have a discussion as a couple to determine which gifts are important to you both. If you’re just moving in with each other then take a realistic inventory of what you both already have and what you need that is new or what needs to be replaced. If one guest purchases an item from your list the registry reflects that it has been purchased and therefore two guests cannot purchase similar gifts. When deciding on a wedding registry it is important to decide if it will be a website registry, a shopping store or a mix of the two. It is important to set up wedding registry in different stores and websites as this will give your guest a wide variety of gifts to choose from. Setting up your registry at different stores and websites registries also ensures that all your guests can easily find the stores to purchase their gifts.If you are inviting guest who comes from cities outside your area it is always advisable to select a store that has a national presence or website registry so that such guests can buy their gifts online. When selecting gifts for your registry always remember that some guests may want to purchase gifts that are more expensive and some may end up wanting to spend more on you than you anticipated. Some of the invited guests and family members may opt to purchase gifts as a group so when setting up a wedding registry always include gifts that are more expensive which might favor groups more than individuals. After setting up your wedding registry you should determine how to inform all the guest that its ready to be viewed. This information may include information about your registry website or where your registry store is situated. The best way of doing this is to point the guest to the websites of the stores you chose so they can get maps and directions. This information may also be sent to the guests when they receive their invitations. Another important aspect to consider when setting up a wedding registry is that they should be set as early as possible as many guests purchase their gifts early. It is considered rude to wait until the last days coming up to the wedding day to notify guest of a registry. Setting up a wedding registry early also gives you enough time to compile a list of all items that you need as gifts and also gives you time to review the list in the event you may have forgotten an item or two. One of the most important items to put into consideration when setting up a wedding registry is that you should only register things that you need, items that will assist a couple in starting their new life together should be given first priority. Review your list a few times to make sure the items are absolutely necessities. Also consider adding online purchases only to your registry as they’ll be more difficult and time consuming to acquire once you arrive back from your honeymoon. You may also choose to add services to your wedding registry such as having your wedding dress preserved or even adding an upgrade service from the resort you’ll be staying at during your honeymoon. These types of gifts can be a lot of fun for guest to participate in and you can even take photos of your excursions which the guest made happen and send a copy in their than-you cards. Check out more all inclusive gift ideas at theknot.com or click here to order a wedding dress preservation kit. Finally, while you’re planning your wedding you should remain organized as many events occur before the wedding date such as your bridal shower. 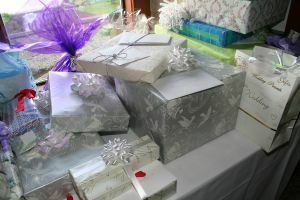 During your bridal shower many gifts are received which have been bought from the wedding registry. You should always update your wedding registry to avoid duplication of items during the wedding. It is important to label all the received gifts so that you can be able to thank all your guest you received them from. Unless you live under a rock then we’re sure you’ve heard that the wedding of the century is finally on. Yes, that’s right, Brad Pitt and Angelina Jolie are getting married. We can only imagine what type of affair this will be.. the wedding gown, the flowers, the guests. Will they go the Anna Paquin and Stephen Moyer route and hold a secretive private wedding or will this be a celebrity packed gala with all the typical bells and whistles? 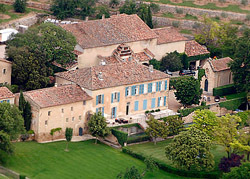 While no one knows for sure we do have some good guesses as to the Brad Pitt and Angelina wedding location. To get an idea of where this elusive location may take place we need to take a look inside the couple’s well guarded lives. Whether Brad and Angelina marry in England largely depends on how quickly the couple plans on tying the knot. Angelina and Brad will be in England for quite a while considering she’s filming her next 3 movies in the country, with her role in the upcoming “The Counselor” being a joint venture between the couple. 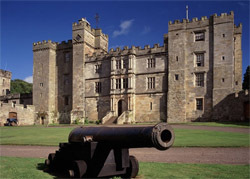 There are certainly plenty of magnificent venues in the country ranging from the hauntingly beautiful Chillingham Castle to the private Coombe Abbey. It’s rumored that a big reason behind their engagement is pressure from the kids which we’re sure is going to speed thing up. Who knows… considering how adventurous and non-conventional the couple is, they may just show up at an English justice of the peace one day and surprise us all. What’s the ultimate gift when you can pretty much buy your partner anything in the world? Evidently a waterfall. 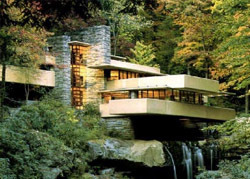 Angelina recently purchased a waterfall and the surrounding land for an undisclosed amount in rural California for her beau after visiting the famous Frank Lloyd Wright house “Fallingwater” in Pennsylvania. Brad was so enamored by the home that he became border line obsessed with the simple architecture and natural features of the home. It’s even rumored that Brad will have a direct role in designing the architectural layout of the home. As far as getting married at future home the question is time. We figure it’s taken the couple a long seven years to get engaged so what’s another five years to get married in the home of your dreams? Wherever the Brad and Angelina wedding location might be, we’re sure it’ll be set to be the wedding of the century with as much surrounding buzz as there are secrets. We say let the couple wed in peace. With all the charity work and awareness the couple has been involved in across the world we think that just this once they deserve a little down time. If you can’t afford to buy your partner a waterfall but still want to give them the celebrity treatment, be sure to check out our Celebrity Wedding Dress Preservation Kit so you too can cherish your big day forever. When most brides think about preserving their wedding dresses, they’re not usually looking to go the cheap route. This is your wedding dress after all, probably the most important and memorable garment you’re likely to wear during your lifetime. We’ve seen the cost of wedding dress cleaning and preservation vary between $99 all the way up to $500+ dollars. You might be asking what you’re getting for those $500 cleaning services that you wouldn’t be getting by choosing a reputable company like the Wedding Gown Preservation Company with prices starting at $149.95. Not much our findings uncovered. We found you often get less with these services as opposed to choosing a company with the industry experience to get the preservation done right the first time and match it with a 100 year warranty on their work. What are you really getting for your investment? Along with a handful of companies online, we found that the biggest culprits of overcharging and under delivering when preserving wedding dresses were found locally. We called a local dry cleaner in NYC and described the dress to the gentleman on the phone as well as told him about a few stains the dress had incurred during the reception. After a long, drawn out conversation along with some slick sales copy that sounded as if were read from the palm of his hand, we were quoted no less than $650 to send our wedding gown to them, have it cleaned and sent back. And get this – we were given the privilege of paying extra for the shipping. In addition, the dress would be placed in a dry cleaning bag and sent back to us in a cardboard box, no preservation box to protect it from the elements over the years and keep on display. By now you’re probably asking yourself how they were justifying the $650 cost of preserving the dress. It’s very simple really, most dry cleaners don’t have the methods and technology in place to make it an affordable process. If you were to ask a cake decorator to be your wedding planner, well, for the right price I’m sure they could do it. At the same time they’ll be charging you for their time and lack of experience which means if you simply paid a wedding planner to organize your wedding it would have been much faster and much easier on your wallet. The wedding planner has years of experience in coordinating weddings and has the knowledge and staff to efficiently carry out all their tasks. When you ask a local dry cleaner to clean and preserve your wedding dress you’re paying them for their time and trouble to complete a process they’re not entirely familiar with. By choosing a company that only preserves wedding dresses, you’re getting the assurance that your wedding gown will be cleaned and preserved utilizing the best possible methods combined with industry leading techniques. Technology also plays a key role in this process as delicate wedding dresses require specialized dry cleaning equipment that is specifically engineered for wedding gowns that contain sensitive beading, lace and other adornments. Also, rather than one person painstakingly examining and cleaning tough stains on your dress, the Wedding Gown Preservation Company has an entire team dedicated to your preservation located at various stations. With each station focused on a different task in the preservation process, you can be sure nothing will get overlooked and your dress will return in half the time than it would at an inexperienced dry cleaner. All these factors from inexperience to the lack of a process adds up to an extraordinarily high wedding dress cleaning cost. Another important factor to consider is the long term cost of preserving your gown with a company offering a cheaper service or a company lacking experience. Does this company truly stand by their work and offer a warranty on the preservation? Do they have a means to protect your dress from yellowing over the years and what will they do about if if it does? You can’t put a price tag on preserving a memory and you also can’t put a price tag on doing a job right the first time. You’ll get the peace-of-mind in knowing your dress will be safe and pristine for future generations to come and when you’re dress arrives looking like it did the day you first tried it on, you’ll know your saved hundreds on your wedding dress preservation cost. When you’re ready to preserve your wedding gown choose MyGownPreservation.com, the leading national retailer for the Wedding Gown Preservation Company. 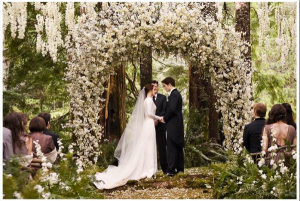 If you have a pulse and if haven’t been living under a rock for the past year then you know of the big marriage scene in the latest Twilight series Breaking Dawn. With the exception of Kate Middleton’s big to-do, watching Bella officially chooses the vampire over the werewolf has been the most anticipated moment of the year for giddy 14 year old girls across the country. So what does one wear when marrying a 100+ year old vampire in front of his vampire family? A $35,000 dress of course, designed by Carolina Herrera, wedding designer to the stars (and according to the next movie in the series, would-be vampires). In a recent article published by Town & Country, Carolina state that lead actress Kristen Stewart was “visually emotional” when trying on the dress for the first time. Whether this was due to her getting caught up in the thought of someday wearing a wedding a dress equally as beautiful on her big day or simply getting into character is left to our imaginations. 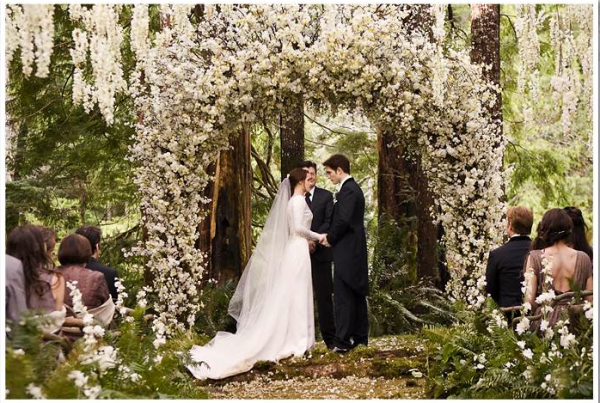 What would it cost the Twilight producer for a wedding gown cleaning and preservation? “Just $189.95 for the celebrity treatment”, says Leah McCoy, the owner of MyGownPreservation.com. “All our brides get the same celebrity treatment and yes, we’ve preserved many wedding dresses for well known celebrities”. Will they be getting this particular dress cleaned or preserved? “Probably not” says Leah, “We’re certain every little spec of dirt or sweat mark will be cherished forever by the star-struck fan lucky enough to attain the dress in the event it is auctioned off”. Those mere mortals who aren’t terribly interested in cherishing their own sweat marks and dirt stains are welcomed to visit http://www.mygownpreservation.com for a cleaning and preservation. You might not be a celebrity yourself but you can treat dress like a one with a premium preservation from their team of experts. Wedding gown preservation has been a service that has been offered for nearly 300 years, ever since the traditional, formal wedding became a big affair. In England, revealing the royals wedding gowns became a really big deal, rivaling that of a sporting event in today’s age. Much to-do was made when speculating what style the princess would be wearing and after her big day the local tailor went to work preparing the gown to be preserved and displayed for the entire kingdom to gaze upon. While today we live in a much different age you can still get treated like a royal when preserving your wedding gown. Modern technology and advancements in materials allows your gown to be preserved and guaranteed for over 100 years. Even more important our advancements have also taught us what not to do when preserving your wedding dress such as staying away from paper with acids in them and using UV coated plastic in the wedding gown preservation kit. While you may be tempted to take your gown to your local dry cleaner to dry clean, wrap in plastic and stick back into your closet, it is highly recommended you don’t take the cheap route and instead opt to take your gown to a professional. Just as you wouldn’t take your car to a carwash to get your engine fixed you also shouldn’t take your dress to a business that doesn’t solely focus on wedding gown preservation. Wedding gown preservation specialists understand the special material, beading and lace that comprise your dress. They have years of experience in cleaning and preserving just gowns and that knowledge means they can insure your gown will be preserved for future generations to enjoy. They’ll encase your gown in materials that have been proven not to harm the delicate materials and sensitive fabric. This means no acid paper, no materials that allow sensitive sunlight in and a bust form to keep your dress in its original shape while it sits in the preservation box. While it’s recommended that you don’t go cheap you also don’t need to spend a lot to preserve your gown. Most quality gown preservation companies will preserve your gown for under $200 which includes 2-way shipping to their preservation factory and insurance on the trip back and forth. When you compare this cost with the original investment you’ve put into your wedding gown you can see why it’s well worth preserving your gown with a professional company that guarantees their results. The Wedding Gown Preservation Company has been preserving wedding gowns since 1913 when Sara and Joseph Schapiro started the company in a small town in the rolling hills of Upstate New York. At the time, Sara and Joseph specialized in cleaning and altering gowns for many of the local residents who trusted the family with their treasured dresses. Together, the two came up with many formulas for gently removing difficult stains, many of which the company continues to use today. The company made it through the difficult recession and both world wars to be passed down through the generations and continue the family tradition of gown preservation. Today the company continues the legacy and stands as the largest and most trusted wedding gown preservation company in the world. The Schapiro family has modernized the gown preservation process by investing in new technology and methods and continually hires new gown preservation experts to care for each gown as it makes the roundtrip journey from your door step. Today, preserving your dress with the Wedding Gown Preservation Company has never been easier and more affordable. To start your preservation process visit the ordering page and choose from either the Traditional Preservation Kit or the Celebrity Preservation Kit for more expensive dresses that require extra care. You’ll receive a confirmation of your order and within two to three days your preservation box will arrive. The preservation box consists of a high density, crush-proof box and a special gown preservation bag to protect your gown on its journey to our preservation studio. Simply unfold the box, seal your dress in the air tight bag and place in the preservation box. Seal up your box with the provided ping shipping tape and you’re ready to go. Your preservation box includes a free shipping label so that you can conveniently drop off your box at any Fed-ex or UPS location near you. The Gown is also insured during shipping at no extra cost to you. When your gown first arrives at the wedding gown preservation studio a number is issued to the dress so that you can track your gown throughout the preservation process. Over a period of 5-7 weeks your dress is gently dry cleaned, the beading work is checked and the gown is thoroughly examined for any stains or blemishes that require special attention. Each station your dress passes through has a single person responsible for their task so you can be assured a panel of experts will be working on your preservation. The final stage of the preservation involves treating your dress and sealing it in a beautiful preservation box with a translucent window for you to show off to your children, friends and family. A bust is placed inside your gown to preserve the integrity and shape of your gown throughout the years. Your preservation kit is placed in another crush proof, water proof box and delivered to your door step and is again fully insured for the trip back. Ordering is Easy – Preserve Your Memory Today! It’s that easy! 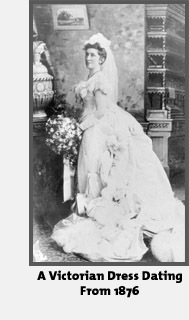 Remember it’s never too late to preserve your dress and the Wedding Gown Preservation Company. They’ve preserved gowns that are over 50 years old and have brought back the color and life that the dresses deserved. Choosing Your Gown – Be Different! As both our families began to discuss wedding plans, I quickly realized there was little I was going to have a true say in. Conversations turned into a power point presentation of why things should be done their way. A part of me was severely annoyed and another part of me didn’t care. The more they do, the less I have too. However, the one thing I knew I had complete control over was my wedding gown. My mother and I decided to go to a bridal store and try on different styles of gowns, which I encourage everyone to do. I tried on 3 white gowns. I hated them. That’s when I found a very detailed, embroidered, red gown that looked amazing. I had to try it on. Looking at myself in the mirror, I knew I wasn’t going to wear white to my wedding. This particular gown was beautiful, but I would’ve altered the design of the gown, in one way or another, to “make it my own”. At this point I had two problems, I knew whatever gown I bought, I would alter in some way and I needed to make sure my fiancé was ok with the idea of me not being in white. To my surprise, he was fine with it. But that still leaves problem number one. I started looking a colors and textures and styles and finally decided, on a whim, to go back to the bridal salon and look at bridesmaids dresses. I found the perfect canvas for what looking for and it was a great price. Plus, I knew of a fabulous seamstress and went to work! I was beyond thrilled with the end product. Knowing that I had designed my own wedding dress, made me feel even more proud to walk down the isle towards my future. I received so many wonderful compliments on my unique choice and even received a special note back from the wedding gown preservation company mentioning how beautiful the dress was and how much they admired my bold decision. My advice to all brides, make your gown your own. Add a sparkle here, a splash of color there. That’s what makes you stand out even more on your special day. The more and more I began to think about it, I realized something, which ever definition you choose to best fit your situation, it’s the coming together and committing the rest of your lives to each other. What an amazing and wonderful thing, to choose someone and have them choose you as their “partner” in life. Remember that when your finalizing your wedding plans. Let that ceremony reflect both of you. Granted not every man is really going to care about the flowers or the color of the bridesmaids dresses, but personalize it to fit both of you. It’s not about how amazing the reception is or how elaborate your wedding gown is. You want people to remember your wedding? Personalize it with some goofy pictures, showing how the two of you are together. Put together a fun choreographed dance, preformed by you and your bridesmaids. Sing to your new husband. Get a useable wedding favor, like a candle holder or something edible. Some of us brides love the tradition. Add your own flare to those traditions. Don’t make your bridesmaids ware dresses you know they won’t ware again. Let them ware a pant suit outfit with the same color top. 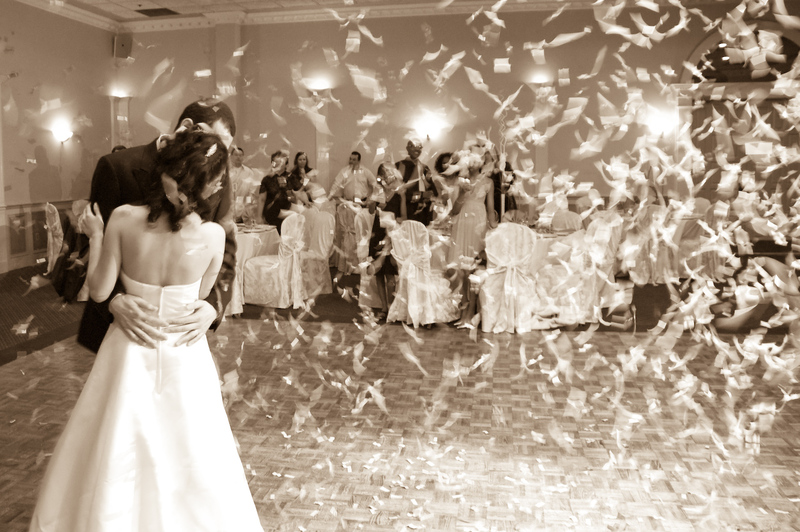 Include your guests in your first dance. Also make sure you send your dress to the Wedding Gown Preservation Company before the honeymoon so you can come home to a clean, preserved dress to show future generations. There are endless possibilities to incorporate your own tastes into your wedding and make it not only a day you’ll never forget but a day your guests will never forget either. So, Ladies, what’s the one event in our lives that will cause us to, laugh and cry, to scream and stress, and ultimately change our lives forever? Weddings, weddings, weddings! For some of us it’s a 24 hour fiesta cram packed with all the trimmings of a traditional wedding. For others it’s a weekend event that will entertain your guests and yourself with out any limitation. And for the rest it’s just a simple Justice of the Peace ceremony. Regardless of how small or extravagant our wedding day is, all of us want to look like we’ve just stepped out of a fairytale. Let’s face it, we go on crazy diets, get facials, go tanning… But the most important and beautiful part of this whole process is our Wedding Gown. For some, it’s more difficult than picking the groom! Here are a few tips on how to make this process a little less stressful. Don’t go into any bridal store with out doing your research! First, before any shopping decide on a venue. What’s your style? Is it a traditional wedding or a beach wedding? Is it a summer wedding or a winter wedding? Second, check your wallet. For those of us that don’t have the luxury of falling in love with any wedding gown no matter what the price tag says, this is an important step. Be smart about it! Think about your venue. Consider all the accessories you will need, from tiaras to shoes to even those alterations. Third, check your body type. Let’s face it ladies, even though that one wedding gown in vogue magazine looks phenomenal on that model doesn’t mean it’ll look good on us. Each one of us has a different and unique body. And we all know that during that day we want to look glamorous, but we also want to be comfortable. Go in knowing you’d prefer a halter top with an empire waist, or a strapless a-line. Fourth, be honest with yourself. By all means don’t hold back trying on fifty wedding gowns if you can handle it. For some, three or four is the limit before our brains and our hearts go into complete overload. If you know that the wedding gown you have in your arms is too expensive for your budget, than have someone find you a wedding gown that is similar in style but with less of a price tag. It is possible! Fifth, bring a loved one with you. Whether it be mom and dad, or a sister or best friend, having a second opinion is crucial. Last, if you are conflicted between wedding gowns, take the time to think it over. Go out to lunch and discuss it with your loved ones. Bring someone else with you to a fitting and get their opinion. This is a big decision! It’s one of the most important moments in your life. You should be going into buying a wedding gown with smile. After your big day be sure to have your gown cleaned and preserved to prevent your precious wedding gown from yellowing and having stains set-in. The Wedding Gown Preservation Company offers full service wedding gown preservation for just 149.00.